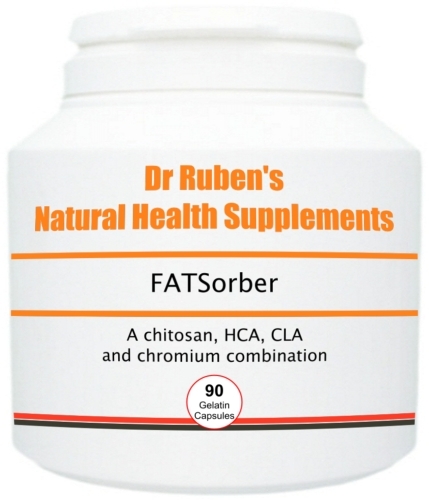 FATSorber contains a tailored combination of specialist weight management and body shape support ingredients. In particular, it contains a unique fibre called chitosan. Chitosan is a fibre-like absorbent substance, which is extracted from marine shells (such as those of crabs and shrimps). It is processed by removing the shells from shellfish, which are then ground into a pulverous powder. Tests show that chitosan powder can bind with up to 6 times its own weight in fat! This ball of fibre and fat can then be passed through the body and expelled. It may therefore also play a part in healthy cholesterol level maintenance. This small, pumpkin-like fruit is indigenous to India and some other parts of Asia. The active ingredient is Hydrocitric Acid (HCA), which is found in the fruit and rind. The theory behind garcinia cambogia is that HCA inhibits an enzyme called citrate lyase that helps turn excess carbohydrates into fat. This is a well-researched fatty acid found predominantly in red meat and dairy products. It is a powerful antioxidant and supports the immune system and muscle tissue to burn calories and fats efficiently. In terms of weight loss support, it encourages the body to use existing fat for energy, thereby helping to reduce fat reserves. Research has shown CLA to preserve lean muscle and reduce body fat levels when combined with regular exercise and a calorie-controlled diet. This is an essential trace mineral that plays an important role in our bodies" normal carbohydrate metabolism, which converts food we eat into sugars. Chromium helps insulin (a natural hormone that is released in response to eating carbohydrates) to properly transport these sugars into cells to be stored as energy. It also supports stable blood sugar levels - crucial for slimmers as low and high "spikes" can lead to cravings, excessive hunger and binge eating. Use before you cheat on a diet or eat "sin foods"
ake 1 - 2 capsules, 2 - 3 times per day, 15 - 30 minutes before meals. Do not take chitosan at the same time as supplements such as Evening Primrose Oil, Cod Liver Oil etc as they will not be absorbed by the body. However, it is recommended to supplement your diet with fat-soluble vitamins and Essential Fatty Acids (EFAs). Chitosan capsules should be taken as part of a calorie-controlled diet designed to help reduce weight healthily. 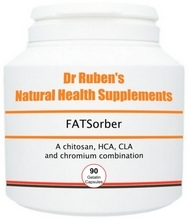 Pregnant, lactating women and people with fish allergies should consult a physician before using FATSorber with chitin.